Time-consuming process of manually checking visa requirements is a thing of the past. VisaEase does the legwork for you, by reviewing visa requirements for every traveller and every destination. This sleek application takes care of the nitty-gritty by automatically inspecting booking files and determining which countries, including transit points, are being travelled to, as well as passenger nationalities. 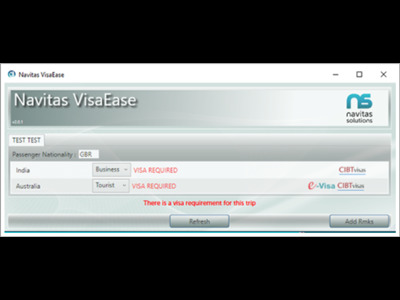 VisaEase works with CIBT, who are the industry leaders in Visa procurement, to determine precisely the visas that are required for each trip. It then displays the overall visa requirements for each country while providing access to any additional info that is of importance. VisaEase cuts out the sluggish manual work entirely.